The countdown is on for the 2019 Open Enrollment season for both Medicare and the Under 65 Marketplace (ACA). We know that healthcare can be overwhelming and that is why Venture Insurance is taking appointments to help you navigate through the confusion. We are currently booking appointments beginning October 1st for the 2019 season. Don’t wait until it is too late to make sure you are completely covered. We specialize in Medicare Supplement, Medicare Advantage, Prescription Drug Plans, Accident and Critical Illness Plans, let us help you navigate through the confusion. Jennifer Johnson is joining Venture Insurance Group as a Medicare and Health Specialist. Jennifer has worked a number of years in education before deciding to focus her passion towards helping others with their healthcare needs. It is rare that a provider will not accept Medicare at all. The vast majority fall into either #2 or #3. What is the difference? When a provider accepts Medicare Assignment (#2), they accept Medicare’s payment in full. If you have a Medicare Supplement or Medicare Advantage Plan, you can know what you will pay. You will be billed your portion according to your plan’s benefits. If you do not have a plan, you will be billed the 20% that Medicare does not pay. Historically, more than 95% of claims have followed this model. 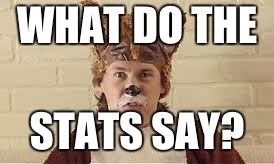 Bill you an additional 15%. This 15% charge is called Part B Excess Charges. On the surface, this practice is distasteful at best. But to the providers’ credit, as Medicare reimbursement cuts continue to lower payments to their offices they may feel the need to increase revenue elsewhere. They may view Excess Charges as necessary, and we at Venture Insurance expect this practice to grow more popular in the future. How Do I Avoid These Charges? Some states have adopted measures that prohibit Excess Charges (see the map above). 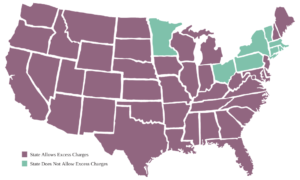 If you receive care in Connecticut, Massachusetts, Minnesota, New York, Ohio, Pennsylvania, Rhode Island, or Vermont then those providers are not permitted to bill for Excess Charges. But if you receive care from any provider in other states, then you need to prepare for them. One way to prepare is by choosing a Medicare Advantage plan and using providers within your plan’s network. Medicare Advantage plans use networks of providers who are contractually bound to honor the payment schedule set by your plan. A second way is to choose a Medicare Supplement plan that covers those Excess Charges if/when they occur. Currently, only Plans F and G cover Excess Charges. Finally, if you have a Medicare Supplement plan that does not cover Excess Charges (or if you have no plan at all), you may ask your provider if they accept Medicare Assignment and also check here to do an online search. There are different rules in different states. And those rules follow you regardless of where you live or where you bought your Medicare plan. It can be important to work with an agency that understands different states and has a national view, which is one reason Venture Insurance Group now writes across the Midwest in Michigan, Ohio, Kentucky, West Virginia, and now Missouri. Contact us for local knowledge with nationwide understanding. We’re obsessed with insurance so you do have to be! 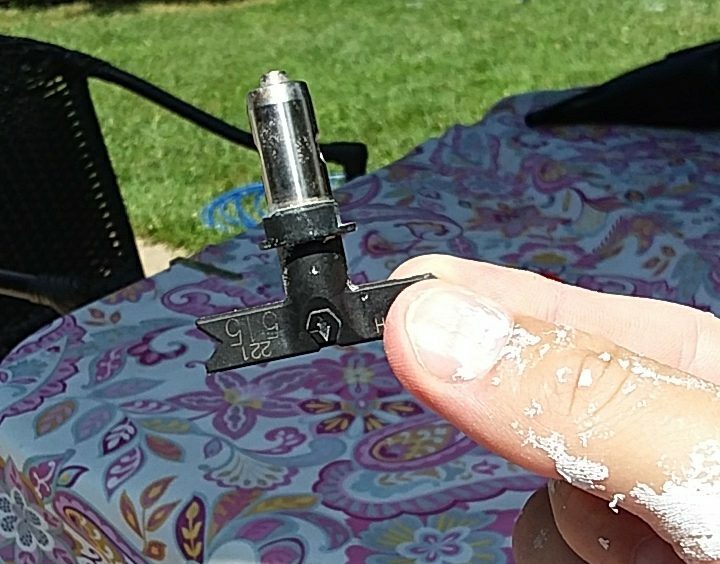 One of my friends recently let me borrow his paint sprayer. Even though this sprayer is the professional model, since I have used others in the past I thought I could figure it out. I spent 90 minutes preparing the machine according to the instructions, but when I tried to spray it all just came out in a giant SPLAT! I spend another 30 minutes trying every setting and reading through the instructions again before giving up. Then I spend another hour cleaning up the mess. As I was putting the last of the machine away, I noticed this part pictured laying off to the side. It’s the nozzle. It controls the spray, and without it the machine simply won’t work as it is intended to. No doubt some of you reading this have experience with this kind of machinery and already knew what this piece was. And now that I have had experience, I’ll know to look for it in the future (I’m trying again Saturday). But it did cost me a frustrating 3 hours prepping and cleaning, so my experience came at a cost. Why didn’t I just ask my friend? My father-in-law and son were with me, and I asked both of them. But they don’t have the expertise to fix this kind of sprayer. Why didn’t I just ask my friend who knows his sprayer inside and out? He could have helped me. So it is with your insurance. Why not ask your friends here at Venture Insurance Group? I will use Medicare as an example, but this applies to all insurance. Medicare provides tools to help you pick a plan, change plans, make sure your doctors are in network and that your drugs are covered. Medicare lists every form you need right online. And every year in the fall they send you an encyclopedia of information in the mail so you have all (ALL – *whew*) of the information you need. Yet so often when I speak with people it is because they are already suffering from being in the wrong plan. And their suffering is more than simply the 3 wasted hours I spend on the sprayer. They have asked their friends and their neighbors. But just as my father-in-law and son were well-meaning, they are not likely to be experts in the matter. Ask your friends at Venture Insurance Group instead. My mistake was to overlook a small piece of equipment no bigger than my pinkie finger. It looked insignificant. Anyone could have missed it. And the truth is, the sprayer still worked. It still spit out paint. The paint was just a mess and completely useless. When you are trying to compare insurance options, you will not know if you have missed some small piece of the puzzle until it is too late. When you need it, you want your plan to cover you in the full, consistent, smooth manner it was designed to do. We want to hear your story. Ask your friends here at Venture Insurance Group. We’re obsessed with insurance so you don’t have to be. Have You Ever Looked at a Hospital’s Ceilings? 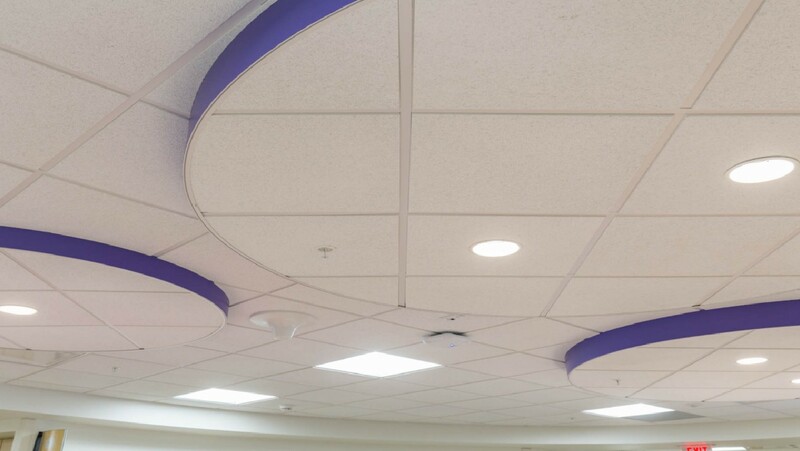 The last time you were at a hospital, did you notice the ceilings? Fortunately, most times I have been at the hospital I have been visiting a friend or walking to get a test done. I see the walls, the doors, the decorations, and the staff. But I recently was there for a minor knee surgery and saw the hospital from a perspective that’s new to me. I was flat on my back on a gurney as I was wheeled from pre-op to the operating room and then to post-op afterward. The whole time my only view was that of the hospital ceiling tile. A lot can go through a person’s mind when all you can see is hospital ceiling tile. No procedure is without risk. Did I remember to bring my crutches? Did I get everything ready at home? There are a lot of unknowns. How much is this procedure going to cost me? What is my deductible? Coinsurance? Is this going to be covered? The best time to prepare the answers to these questions is when you develop your health plan or during your annual review. Whether it’s health insurance or Medicare, Venture Insurance knows ways to package plans together so that one picks up where the other one ends. Often, layering policies this way means you get the best of both policies. Can packaging two (or more) policies together offer richer coverage and lower premium? YES! It’s worthwhile to learn the possibilities to see if packaging plans together is a good strategy for you. Whether you have an individual health plan, a health plan through work, or Medicare, please contact me and ask what packages are available for you. Let us help you find your answers now so that you’re not wondering about the answers while looking at a hospital ceiling. 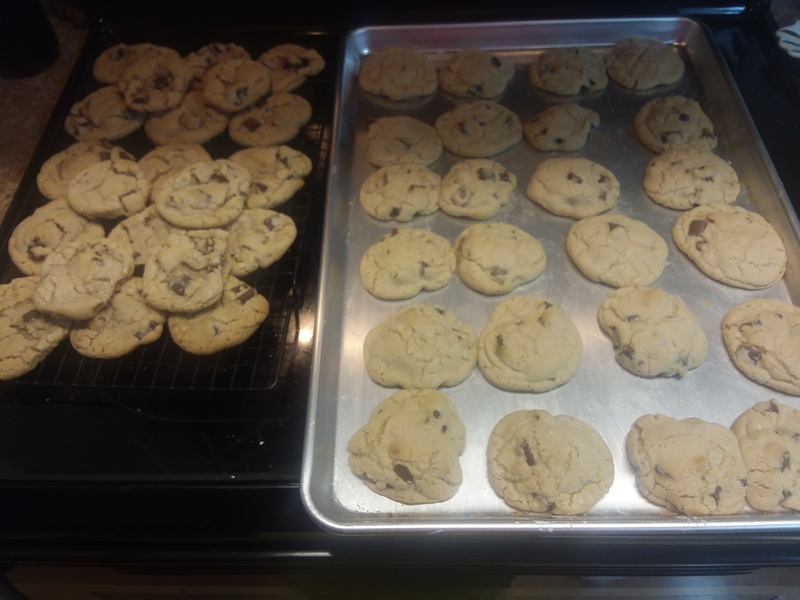 I baked my mom’s famous cookies last night. My kids have gotten used to them as part of their lunch, and they would be disappointed without one. I had “Mom Tate” cookies in my lunch every day while growing up, so I know the feeling. Mom Tate cookies are one of a kind, but Mom has always been happy to share the recipe. After emailing the recipe to one of our carrier reps a few years ago, I received a quick reply that said, “that’s too complicated for me.” Actually, the recipe only has 8 ingredients. They’re the same ingredients probably found in every chocolate chip cookie recipe. Anyone can mix 8 ingredients together, right? The difference is in how my mom puts those ingredients together, so in my email I included details such as: sift the flour, use a silver cookie sheet, and (most important) when you roll out the cookie dough be sure to have a little flour on your hands. It was this detail that the reader found discouraging, but these are vital steps! Originally, my mom may have put a little flour on her hands just to keep the dough from sticking. But that extra flour on top of the dough while it bakes is what gives the cookies the cracked finish. They’re just not the same without it. Details matter. How does making cookies turn into an insurance blog? When we at Venture Insurance Group are asked to help a client, we follow a detailed process. I’ll use Medicare planning as an example, but the same holds true for health, life, auto, home, and all other lines of insurance as well. With Medicare, all of the plan information is publicly available. Anyone can shop plans on Medicare.gov just as anyone can mix 8 ingredients to make cookies. But which plans include your doctor in their network? Which plans cover your drugs? And where can you get Medigap rates since they’re not listed on Medicare.gov? Those are additional steps that we take in our process to make sure your plan is right for you. I took my mother’s cookies for granted while I was growing up. As I got older, I assumed the dough for sale off the shelf would be just as good. I mean – who doesn’t like the dough boy commercials? But even though “off-the-shelf” cookies are good, they just lack that detail that puts them over the top. Had I never tasted Mom Tate cookies, I never would have known what I was missing. An “off-the-shelf” insurance policy may seem just fine for you. But when our clients work with us many of them tell us that they just didn’t know what they were missing. I invite you to visit us at Venture Insurance Group. Remove the taste of “off-the-shelf” insurance and find out what you may be missing. And if we have fresh cookies, we’ll be happy to share. Health Insurance Has Changed. What Are We Doing About It? On April 3, 2018, CMS released the Health Insurance Exchanges 2018 Open Enrollment Period Final Report. We here at Venture Insurance Group are interested in the report because…well, we’re obsessed with insurance. If you pay for your own health insurance, there are others facing similar challenges. Knowing what others have done may help you decide what you want to do. -The average premium nationally before tax credit was $621 (up 30% from $476 in 2017). -The average premium nationally was $153 after tax credit. -The average individual qualified for a tax credit which lowered their premium (83% of consumers received a tax credit). -The average consumer chose a Silver-level plan (63%). -Of those who received a tax credit, the average (82% of those qualifying) income was below 250% of federal poverty level and therefore claimed a large subsidy. -Of those who received a tax credit, the average premium was $89. -Of those who did not receive a tax credit, the average premium was $522. Is there strong correlation between these statistics? Yes. Marketplace plans offer a good solution for many people. But for those who receive little to no subsidy (tax credit), premiums went up significantly. The 15% of total consumers who do not receive a tax credit plus nearly 20% of those who do qualify for a tax credit pay significantly more in 2018 than they did in 2017. That number represents over 3.5 million people in the United States. Every one of them are not average. 2 – What Did People Do About It? Most people purchased a Silver Level Plan and qualified for tax subsidy (which lowers the plan premium), cost share reduction (which lowers the plans copays and deductibles), or both. Those who purchased a Marketpalce plan and did not qualify for a subsidy on average chose a less expensive, lower-benefit Bronze level plan with higher deductibles and copays. -Higher percentage of 55+ (29% in 2018 vs 27% in 2017). -An additional estimated 7 million people purchase plans off the marketplace (source). Those who qualify for no- or low- subsidy may consider off-exchange products at a potentially lower rate. 3 – What Will Happen in 2019? 2. Those who purchase off-exchange plans. Off-exchange products will offer unique solutions in 2019 that have not been available since before the passage of the Affordable Care Act. 4 – What Can I Do? …then as a perfectly average individual, you can expect an off-the shelf marketplace plan to work well for you. But if you are anyone else, consider working with a qualified professional who knows how to turn an average premium into an above-average plan. 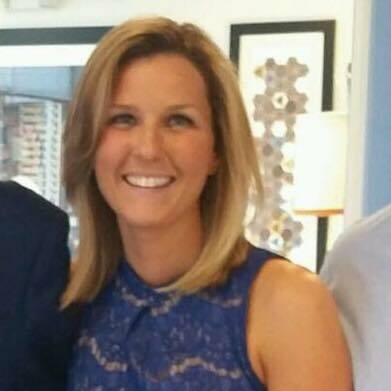 We are so excited to add Crystal to our Health Insurance team! 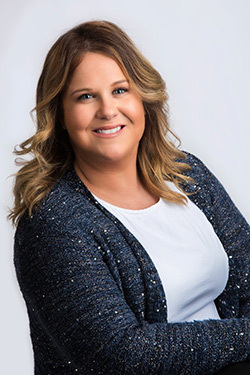 Crystal will be joining Jonathan Tate to help better serve our clients. With Crystal’s background as a LPN she will be a great asset to the agency and our clients.